Posted by Jace Stolfo on Monday, July 20th, 2009 at 2:11pm. Looking for 100% financing? A rural development loan (RD Loan) is one of the few programs available to finance up to 100% of a home’s value. 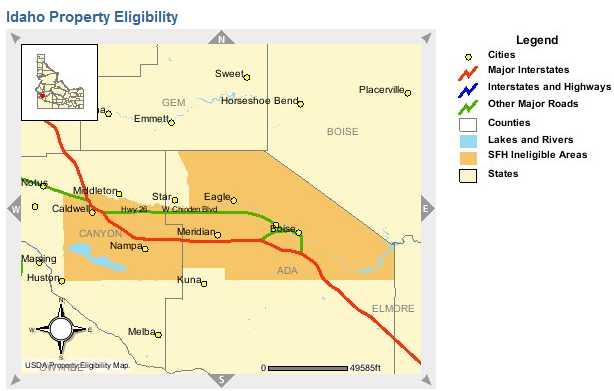 The loan does have restrictions, but if you’re thinking of buying a home in Kuna, Horseshoe Bend, Emmett, or Star Idaho it could be an option for you (see map below for eligible areas). Benefits of a Rural Development Loan: - Up to 100% financing available. - No mortgage insurance. - Financing can include money for repairs and closing costs up to the home's appraised value. - Many eligible homes for sale in Star, Horseshoe Bend, Emmett, and Kuna Idaho. Both the property and the applicant must meet certain criteria to qualify for a Rural Development loan. This program was created to help moderate income families obtain affordable home ownership, so income limits, purchase price limits, and area qualifications do apply. Key Applicant Requirements:- Owner ability to occupy property on a permanent basis - Sufficient and stable income not exceeding 115% of the U.S. median family income. - Acceptable credit score and history. Property Requirements:- New or existing stick built or modular home meeting HUD guidelines. - New manufactured home on a permanent foundation. - Owner occupied and not produce an income. - Located in a qualified rural area. Disclaimer: Information not guaranteed. Contact your lender to determine eligibility. Search homes for sale in the Boise, Kuna, and Star Idaho area. 2 Responses to "Kuna and Star Id Homes | 100% financing RD Loans"
jamie wrote: What is the best way to know what is considered rural development property and qualifies for those loans? Posted on Monday, April 23rd, 2018 at 2:00pm. Jace Stolfo wrote: Hi, Jamie. I'd recommend you call Sean Palmer at Idaho Central Credit Union (208-846-7109). They offer the RD Loan but sure to also speak with them about other options they have available. Thank you. Posted on Monday, April 23rd, 2018 at 2:40pm.